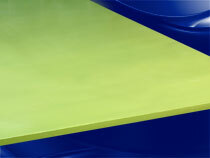 For high load, high speed and severe sliding abrasion applications, TIVAR® Ceram P® should be THE material of choice. Its high tensile strength and wear resistance have been successful in the lumber, paper, steel and agricultural industries. Composed of virgin polymer and premium additives, TIVAR® Ceram P® is a shatter-resistant alternative to sintered ceramics, reducing parts wear and machine maintenance downtime. Easily recognizable by the lime-green color, TIVAR® Ceram P® is available in 48" x 120" sheets with gauge sizes ranging from 1/16" to 2". It is also available in gauge sizes 3/4" to 3" in 20' lengths. TIVAR® Ceram P® does not meet FDA or USDA guidelines for food handling/processing.